California drought regulators sent the strongest signal yet that they're serious about cracking down on water waste by proposing a first-of-its kind, $1.5 million US fine against a group of farmers they say illegally took water. The fine announced Monday by the State Water Resources Control Board is the first ever levied against an individual or district with senior rights that are more than a century old and have long provided immunity from mandatory conservation. The fine follows months of unprecedented cutback orders to communities, businesses and the powerful agriculture industry during the fourth year of the devastating dry spell in California. The state is fighting off court challenges to its authority to control water use and doubts over whether it has the resources to enforce its orders. 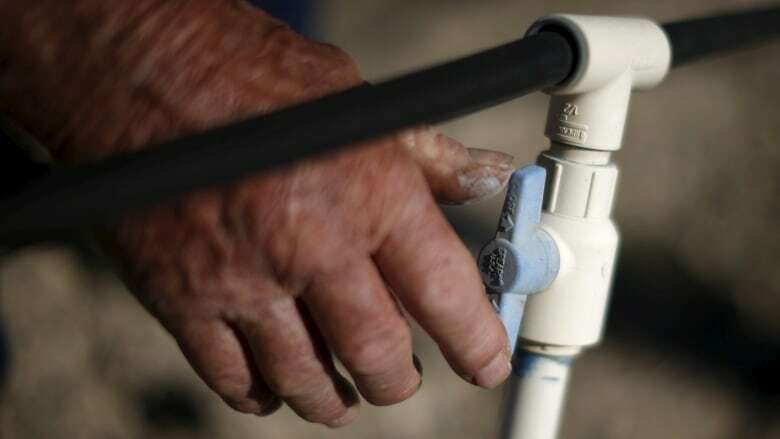 The water board levied the historic fine against the Byron-Bethany Irrigation District, which serves 160 farming families and a suburban planned community of 12,000 people in the Central Valley. Andrew Tauriainen, a water board prosecutor, said the district was outspoken over continuing to illegally take water, and the fine should show others such brazenness will draw the attention of investigators. Byron-Bethany Board President Russell Kagehiro said the state was making an arbitrary example of his district at the expense of its customers and farmers, which stand to lose $65 million in crops under the cuts demanded by the state. The district has previously filed a lawsuit seeking to preserve its water access. "Farmers have to sort of weigh the cost of losing that crop, I guess, against potential fines," said Jeffrey Michael, an economist at the University of the Pacific in Stockton. The equation is particularly challenging for those who contend the state has no authority to order them to conserve because their rights predate the modern water permitting system in 1914. Courts have yet to rule on the matter. These senior water rights holders have strong incentives to fight any state-ordered curtailments because they will likely see similar cuts in future dry years if they yield in this drought, Michael said. Water board officials say they plan to issue more penalties and orders later this summer to stop taking water. The board has sent out more than 9,000 notices across the parched Central Valley warning of short water supplies. Some continue to draw anyway, including the San Francisco Public Utilities Commission. The agency intends to divert water for the city-operated Camp Mather near Yosemite National Park until it receives a cease-and-desist order, spokesman Tyrone Jue said. The water board would not confirm if San Francisco was under investigation as a result. State inspectors have conducted about 1,200 investigations in the past year but only took action on two, including Byron-Bethany. Officials say some cases from last year are still dragging because the state doesn't have enough people to handle all the work. "Our resources are somewhat limited here, and we are taking our cases as we can get them and as we can develop them," Tauriainen, the water board lawyer. In the case of Byron-Bethany, the water board says state data shows illegal diversions of water from a pumping plant in June after the district received a warning that the watershed was too dry to meet demand. District general manager Rick Gilmore said he did not know a penalty was coming and wasn't aware of the details. The water that the state believes was taken might have been supplemental supplies purchased by the district, he said. Byron-Bethany has 20 days to request a hearing before the water board to contest the fine, although it's unclear how long it could take to resolve the case. The maximum penalty the five-member board could assess is $5 million, depending on how the water was used.